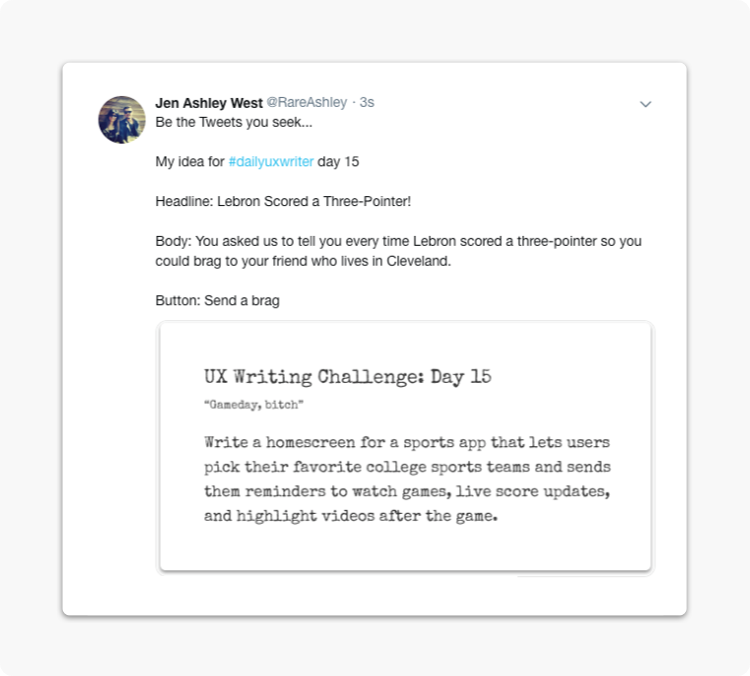 Get a UX writing prompt in your inbox every weekday for 14 days—and a final full-length content challenge on day 15. Actual prompts from the largest product organizations in the world. No spam. Just practice. Free forever. Just need an email and we'll send the challenges. No spam. No noise. Just practice. And why it's probably a good idea. 1 of 14 short exercises will be delivered to your inbox every day for 14 days. Including: a scenario, a challenge and how many words you have to work with. On day 15 you get a final content challenge—the same ones big companies use to test your skills during interviews. Google, Paypal, Spotify, Amazon, Dropbox—they're all hiring UX Writers right now. It's a hot job. Is it a fad? Probably not, and the hiring process starts with the dreaded content challenge; random scenarios designed to test your skills in writing for the end-user. Not to fear, they're a piece of cake if you've prepared. If you haven't prepared you're totally fucked. But that's why we're here. Write and edit your solution as fast as you can. Try to do it in ten minutes. 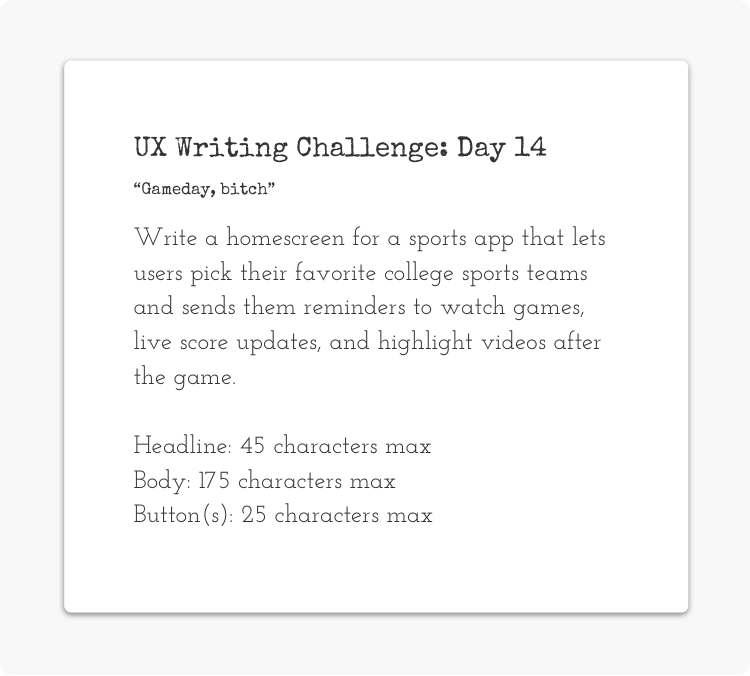 Most UX writing and content challenges are timed exercises. If you can do it even faster, that's even better. On the final challenge you'll have an hour; it goes fast. Ask anyone who writes for a living; they'll tell you that remembering the rules so you don’t sound like a hack is an almost impossible struggle—and being able to write fast and consistent? That's even more impossible-er. Also, the hiring manager will want to know if you can do good work fast and under the pressure of a deadline; so you'd better start timing yourself now. Feedback is everything. Join the private Facebook group and post your copy there. Or, if you want to go the extra mile, post all of your content on Medium (or on your personal website) then share the link. 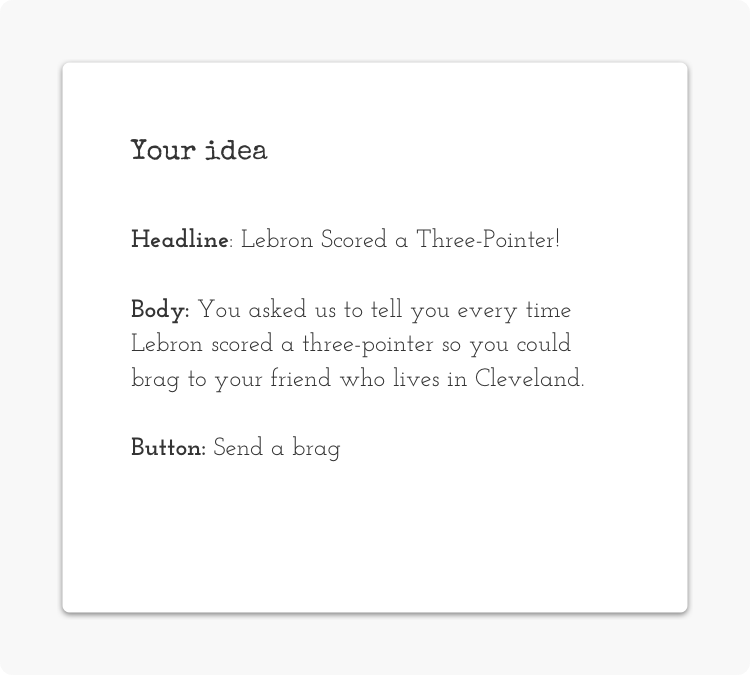 Bonus benefit—after 14 days you'll have a ready-made UX Writing case study for your portfolio. Are you a UX designer? Developer? Product manager? A copywriter who wants to brush up on your UX skills? Post your copy on Facebook and the Daily UX Writing community will give you notes and suggestions. We've got a pretty active community with hundreds of members since launching in January 2019. It's also home to the most positive interactions we've EVER had while using the figurative "dumpster fire" that is social media. So it's got that goin' for it, which is nice. If you post your challenges on Medium or your blog or portfolio, be sure to send us the link so we can share. UX writing isn't hard, but it is weird if you're new to online marketing or product development. Here's some "how-to" guides to get started. Click here to view all of them.